Nobel Biocare offers an extensive assortment of bone-level and tissue-level dental implants for all indications, bone types and surgical protocols. Osseointegrated implant is a type of implant defined as “an endosteal implant containing pores into which osteoblasts and supporting connective tissue can migrate”. Applied to oral implantology, this thus refers to bone grown right up to the implant surface without interposed soft tissue layer. Get to know what our patients say about us. Parasu Dental Hospital was started in the year 1994 in Kasturibai nagar, Adyar with all the facilities by Dr. Chelliah Venkataraman. Being the first multi speciality dental hospital with all facilities under one roof. Parasu Dental Hospital offers specialty treatment with state of the art facilities like latest diagnostic tools, specially designed dental & orthodontic software, comfortable dental chairs and computerized client management system. The hospital extends a wide range of services, be it, esthetic improvement, implants, orthodontics, surgery or full mouth rehabilitation. Parasu, has improved the self confidence and appearance with a beautiful and healthy smile of over 50,000 patients served by it. P arasu dental hospital pvt.ltd was founded by dr.chellaiah venkataraman ,M.D.S,D.Sc ,who is a distinguished orthodontist and senior surgeon in the field of dentistry. 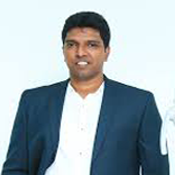 Dr.Vivek Pandian MDS Oral Maxillo Facial Surgeon and Implantologist ,has specialised in his field and has placed more than 2000 implants till date. Additionally, he is one of the founder of Dental Implant Training Academy ( DITA ) and conducts Implantology course for dentists with DITA team. a month ago- I Arul Prabin 29, Working in maldives as a nursing administrator,I had a infected teeth And i came to know about parasu Dental Hospital through my relatives . It was a good experience And i felt good patient care and best treatment. I have done a teeth implant And I Strongly recommended Parasu Dental Hospital is one of the best..
i have done implant at Parasu Dentail hospital, Santhoshapuram. The work was done by Dr. Vivek and Dr. Jency. I am happy to do the treatment here. good result. I Strongly recommended Parasu Dental hospital. Doctors are so caring. The follow-up is awesome.